Owning a restaurant is often a chef's dream. Calling the shots and creating the food you want can be alluring after years of dong a proprietor's bidding. But owning a small business comes with its own share of miseries and headaches, and the restaurant business is especially brutal. A high percentage of these businesses shut their doors within the first year or so. Such was the case for Chef Otto Graham, who closed the Knife and Fork last December. 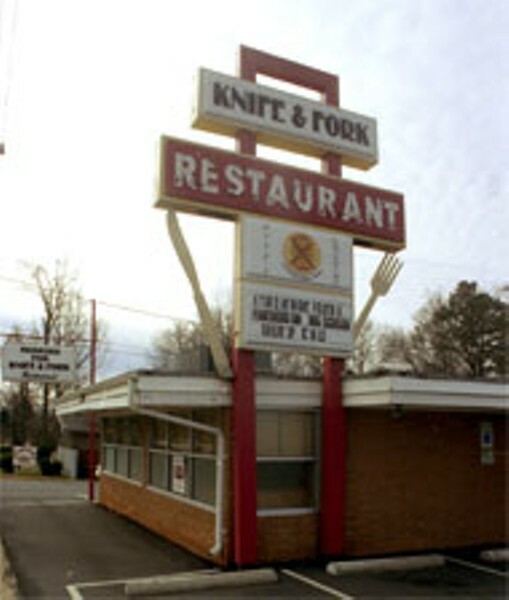 The Knife & Fork was a Charlotte landmark that originally opened in 1963. The original owners called it quits in 2001, at which point another group reopened it — and failed. The building stood empty until Graham opened it again in 2003. Graham trained at the Culinary Institute of America in Hyde Park, NY, interned at the Rainbow Room, and then worked in two Italian restaurants in Manhattan's SoHo before coming to Charlotte. He had spent his career on the opening teams of many of the area's better restaurants, including LaVecchia, and served as the Chef du Cuisine at Upstream, the Executive Chef at Toscano and the Executive Chef who opened Luce. While working for owner Augusto Conte at Luce, Graham decided he wanted to have his own place. Graham used his personal savings and money from his family to finance his restaurant. "When I sat down with the landlord, he figured it would cost about $50,000 to open the doors," he explains. "But I immediately spent about $40,000 on equipment and that was just the beginning. We had to completely renovate, from the grease trap to the interior design. The problem was I didn't have enough money to start. I had to keep borrowing money. The renovation cost me about 200 percent more than I had budgeted. And that put me behind for everything. You can't rely on the business to bring in your capital. It doesn't work like that." Restaurants close for a variety of reasons or a combination of reasons, but the most common one involves under-capitalization. This is especially true for independent operators who have a more difficult time securing loans and other financing. Working capital is the lifeblood of every business. "I know now that I needed a partner who had knowledge of the front of the house," confesses Graham. "That was one of the things I was missing. I needed someone I trusted like a family member. In some restaurants, the husband is in the kitchen and the wife runs the outside. You need that, or a financial partner who can run the front. "It takes a while to learn," he continues. "My friend John had a failed restaurant, but now he has five successful ones. You learn the hard way — the expensive way. I've learned that location makes a difference. You need a location with foot traffic and a lot of residents with disposable income like Uptown, SouthPark or Ballantyne. Keeping the name of the restaurant also hurt me. I know that was my concept — my dream — but it hurt me in the beginning because it had been a low-end Greek-type diner for breakfast. Plus, the place had been closed for two years. We had more to overcome than we thought." Graham said it took a while for people to realize there was a new Knife & Fork. He eventually added "Otto's" to the name. As fate would have it, the construction on Independence worked against him as well. Soon after he opened, the construction and detour of Albemarle Road and the shunting of cars to Sharon Amity kept people away from the intersection. "During rush hour, cars would line up in front for hours of the day, but Independence looks like a ghost town at night. Too many empty big boxes. People shy away from it." What are the other hard-fought lessons he's learned? "My advice to a chef wanting his own place is to get to know the books. It's more important than the food. You have to know how to control labor costs and actual accounting. You have to know how to close (nightly) the restaurant. It is an advantage to work the front of the house as well as know the kitchen." Graham, who's single, also notes, "There's no personal life if you own a restaurant. You'll need the support of a (spouse) to take care of personal things and keep the house going and pay those bills. I was working 12-hour days, seven days a week. For Graham, though, even knowing what he knows, the dream to have his own place again lives. This time, he'll be prepared: He's now working in the front of the house at a friend's restaurant. "The concept of the Knife & Fork couldn't have been better," he enthuses. "My dream was to get an old space and bring it up with my food. There's nothing better than going into the dining room and hearing the acclaim. There's a magic about it."